Neurodegenerative regions for poly-omic molecular analyses. MEDIMPRINT’s technology breakthrough rests on the integration of functionalized silicon chips to surgical stylets for atraumatic sampling. Through an original « hide and display» principle, the brief and specific interaction of the silicon chip with brain tissue enables a simple apposition contact and the collection of spatially-oriented imprints. R&D department has also developed appropriate and specific on-silicon molecular analytical approaches. In 2015, the safety of our first product range, GlioPrint, has been validated in a phase-0 clinical trial. In 2016 a multicentric phase-I clinical trial that plans to include 150 patients with glioblastoma (grade-IV brain tumors) has been initiated in close collaboration with four hospital centers: University Hospital of Grenoble, University Hospital of Angers, St Anne Hospital in Paris and University Hospital of Creteil. Tumor molecular heterogeneity and peritumor molecular content will be addressed in this clinical trial to confirm existing, or to highlight new therapeutic targets. In 2017, MEDIMPRINT should present through a phase-0 clinical trial its second product range, StimoPrint, a medical device for brain tissue imprint in Parkinson’s disease. StimoPrint should offer the unique opportunity to explore molecular content of pathological brain regions in living patients; opening the way to new paradigms in neurodegenerative disease-related research. Engineered with forward-looking, research-concerned neurosurgeons, neurologists and scientists, Medimprint’s products are perfectly compatible with current surgical procedures such as stereotactic brain biopsy, tumor resection or deep brain stimulation surgery. MEDIMPRINT’s venture has started in 2015 with ILAB First Prize in “Health” category and has continued with its selection for the first stage of “Concours Mondial de l’Innovation”. 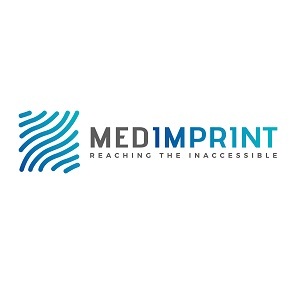 MEDIMPRINT® is a Startup from Clintec Lab and is the result of a close and efficient collaboration between CEA, INSERM, Grenoble University and Grenoble University Hospital.